An essential tool for the kitchen gourmet or professional chef alike, this unique edge grain hard maple cutting board will make a beautiful addition to any kitchen. Our “Boat-Shaped” edge grain butcher blocks are the perfect size for cutting cheese, preparing snacks or small meals. Because of their convenient size, they store away easily, and clean up is a snap. 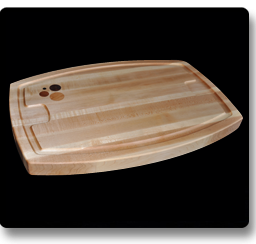 This cutting board is fully reversible and comes sealed with food safe Danish Oil. An essential tool for the kitchen gourmet or professional chef alike, this unique end grain hard maple/cherry cutting board will make a beautiful addition to any kitchen. 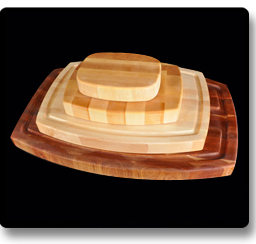 Our “Boat-Shaped” end grain butcher blocks are the perfect size for cutting cheese, preparing snacks or small meals. Because of their convenient size, they store away easily, and clean up is a snap. 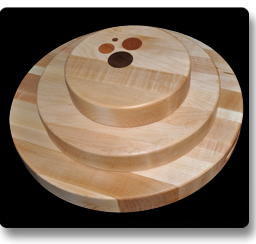 This cutting board is fully reversible and comes sealed with food safe Danish Oil. Our Large Roast Edge Grain Cutting Boards were designed to handle everything from prep, to carving and serving the Thanksgiving turkey! Featuring a huge 15 ½” x 23 ½” cutting surface, this roast board is big enough to handle any dinner party. A full perimeter juice groove has been routed to help prevent spills, and the routed hand grips give added stability when used for serving. The natural wood color variation makes each board unique, and is a beautiful addition to any table. Our Large Roast End Grain Cutting Boards were designed to handle everything from prep, to carving and serving the Thanksgiving turkey! Featuring a huge 15 ½” x 23 ½” cutting surface, this roast board is big enough to handle any dinner party. A full perimeter juice groove has been routed to help prevent spills, and the routed hand grips give added stability when used for serving. The natural wood color variation makes each board unique, and is a beautiful addition to any table. An essential tool for the kitchen gourmet or professional chef alike, this edge grain hard maple cutting board will make a beautiful addition to any kitchen. Our round edge grain butcher blocks are the perfect size for cutting cheese, preparing snacks or small meals. Because of their convenient size, they store away easily, and clean up is a snap. 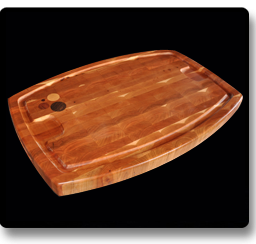 This cutting board is protected with a food safe Danish Oil that enhances the natural color tones of the wood. It is also fully reversible, so both sides can be used equally. An essential tool for the kitchen gourmet or professional chef alike, this end grain hard maple/cherry cutting board will make a beautiful addition to any kitchen. 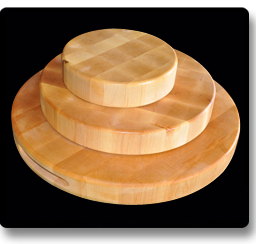 Our round end grain butcher blocks are the perfect size for cutting cheese, preparing snacks or small meals. Because of their convenient size, they store away easily, and clean up is a snap. 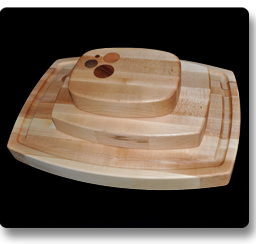 This cutting board is protected with a food safe Danish Oil that enhances the natural color tones of the wood. It is also fully reversible, so both sides can be used equally. 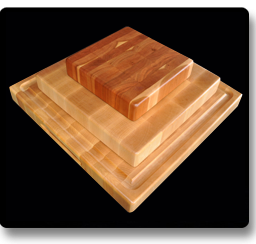 Our 15 ½” square edge grain butcher blocks are becoming one of our biggest sellers! The large cutting surface is perfect for prepping the family dinner. We have routed a juice groove around the perimeter to help contain messes, and also routed finger grips to give stability when serving. A beautiful cutting board like this can be left on the counter all of the time. The natural color variation makes each board unique and a fine addition to any kitchen décor. 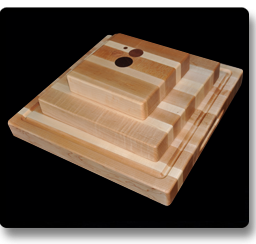 Our 15 ½” square end grain butcher blocks are becoming one of our biggest sellers! The large cutting surface is perfect for prepping the family dinner. We have routed a juice groove around the perimeter to help contain messes, and also routed finger grips to give stability when serving. A beautiful cutting board like this can be left on the counter all of the time. The natural color variation makes each board unique and a fine addition to any kitchen décor.